Media Size Choose an option16" x 20"18" x 24"24" x 32"
In life, we’ve either known someone or have ourselves encountered life’s unfortunate events. Motor Marc has created another painting incorporating angels to help remind us of the dangers and sacrifices our roads may lead us. Thankful of his god given talent, this painting exhibits Marc’s spirituality. 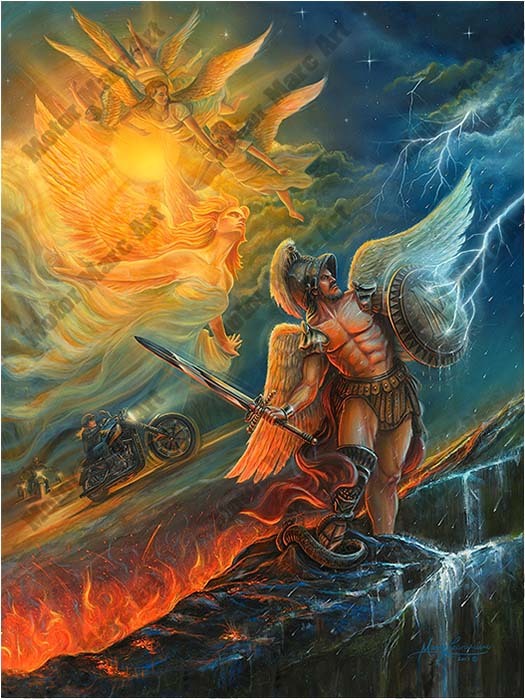 Through the power of a strong guardian angel gives courage to ride through all paths of life. Whether your path be clear and certain or dark and filled with debris. The choice to continue the ride will always be on your side. This painting will be the guardian on our walls and will reignite your belief in yourself. 16" x 20", 18" x 24", 24" x 32"